I think this Arcade Block solidifies the fact that out of all the Nerd Blocks, Arcade is the best. At least it gives my gamer heart the most happiness. This month celebrates The Legend of Zelda. The game I spent copious amounts of time over, killing baddies and collecting treasure. 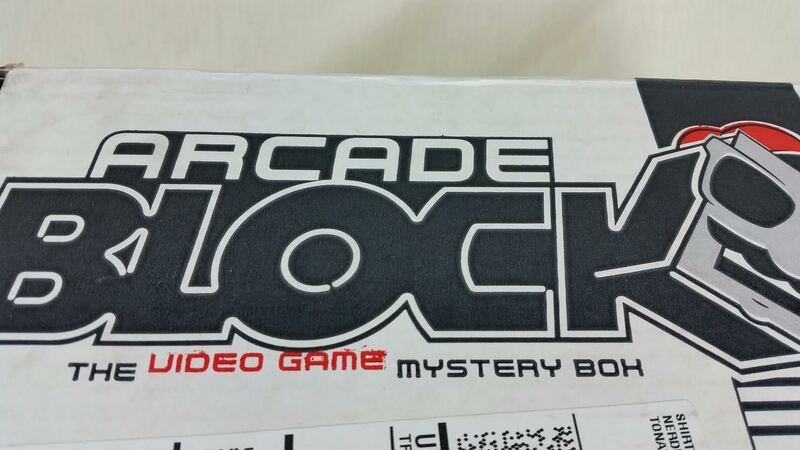 So much gamer goodness was in this box. I like boxes with substance, not filler and I felt that this was jam packed with phat l00t. Although I received this box in October, it's actually the September box and ships so late in the month that it arrives in the next. I opened this during a game night when my husband had all our friends over. This usually means an RPG until it devolves into Smashbrothers or Dead or Alive. Although it may be Castle Crashers tonight. 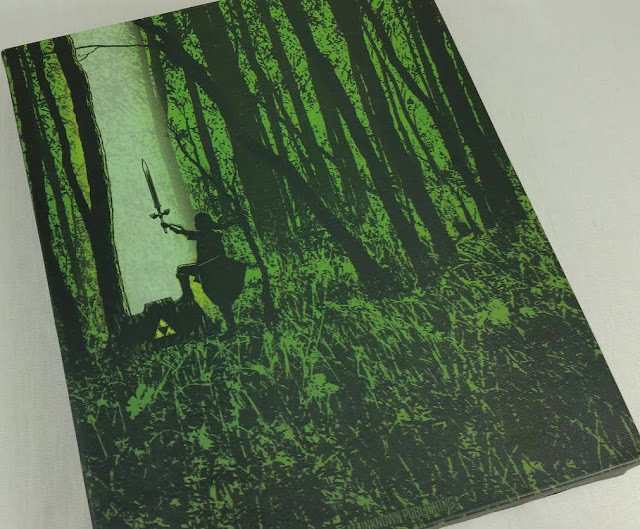 "The Hero's Triumph" Gallery Wrapped Canvas Print- Okay, so after everyone thought the shirt was amazing, this was next out of the box. I think this might have made my husband (and everyone else) more happy than the t-shirt. This is when the questions about what was this box and how do they get it started being asked. 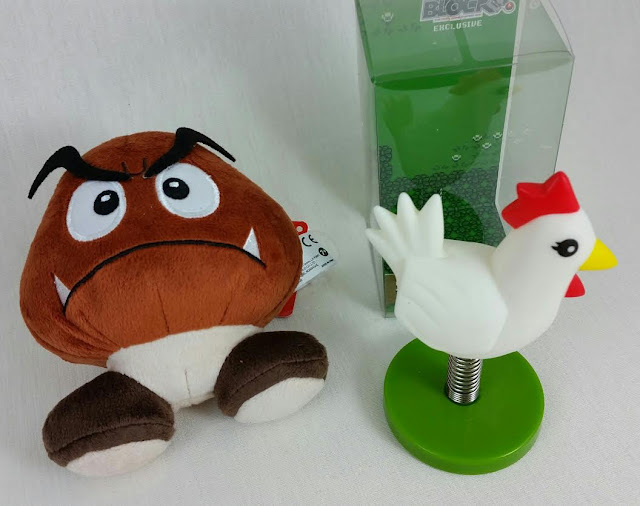 Goomba Plush- This is a 5" plushie of a mushroom kingdom baddie. If I told you how many of these I've killed (or how many have killed me) you probably wouldn't believe me. Hey, I started playing Super Mario when I was 10. That was when the game came out in 1987 and it was the best thing that I'd ever played in my life. I still have fond memories of sleepovers playing this, high on candy from Grandma and loaded with orange soda. And yes, there were numerous fights over who got to play next. Spring Chicken- Mwuahaha! Now I can tease my husband for not being as all-knowing about games as he thinks he is. He thought this was from Minecraft (and since he is usually right, I believed him). Thanks to my anonymous commenter for pointing out that this is actually from Legend of Zelda- A Link to the Past". I might love games but I've never been one for remembering every detail. Those people who make the game "walkthroughs" are kind of unbelievable. 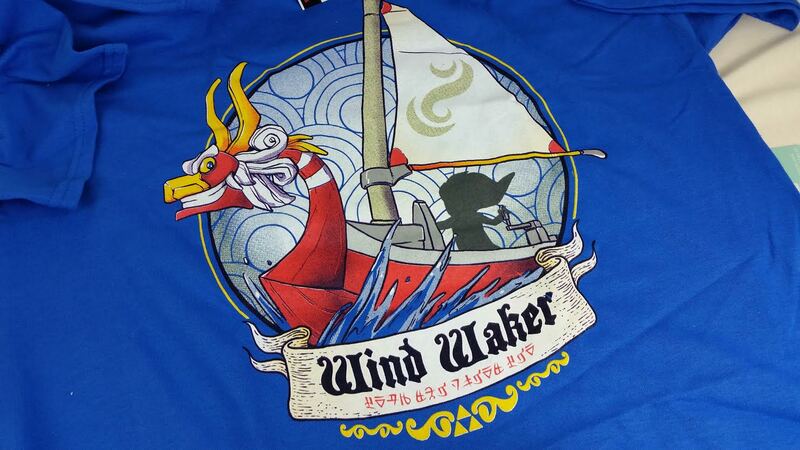 Legend of Zelda T-Shirt- Exclusive Wind Waker T-shirt- This... seriously. Is awesome. I gave this box to my husband to open after I'd taken photos and all the guys were jealous when he held it up. All had to admit that they would wear this happily. Galak-Z 7" Record- I freely admit I have no idea what this is. 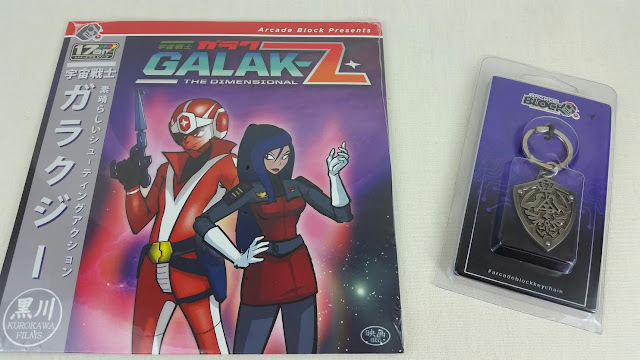 I mean, I know what a record is since I used to have a record player but I've never heard of the Galak-Z game or it's soundtrack. This is two tracks from the game. Value: Hard to say because you can't use it without a record player which very few people will have, which means it's basically worthless unless you spend money. Sooo... yeah. The Hylian Shield Keychain/Pendant- I think this is pretty cool, too. It's a keychain but if you remove the ring and string it on a chain it can be a pendant, too. I would totally wear that but my husband has it on his keychain now. VERDICT: Nerd Block has a few different version and Arcade Block is the best. That being said I still feel it's more expensive than it could be. That's because it's shipped from Canada and Canada has insane mail prices. Because of that I try to only subscribe when the theme is something I know I'll enjoy. It's kind of annoying to do the subscribe/unsubscribe thing but Nerd Block makes it really easy for you to do from your account. This one was definitely a box after my own heart and I'm really glad I subscribed for it. 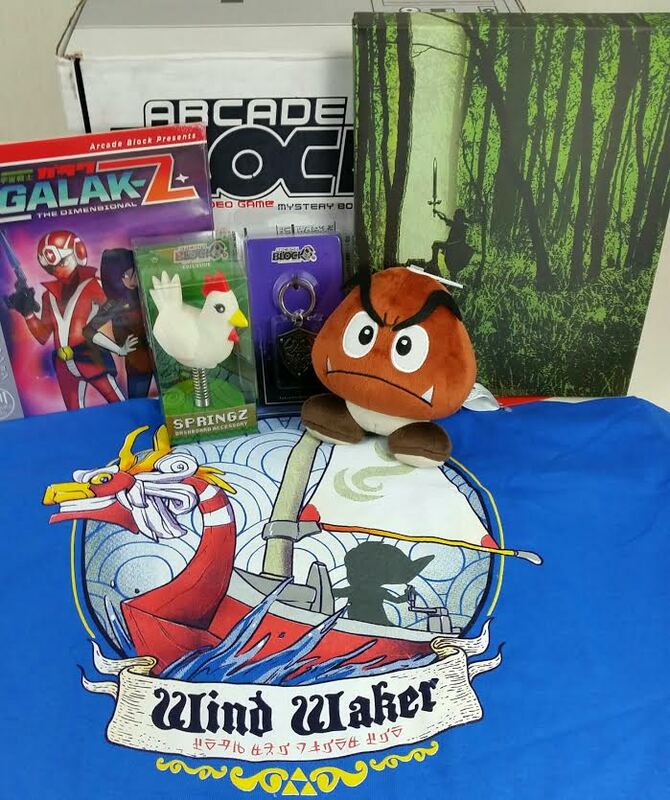 If you would like to subscribe to Arcade Block, you can do that here. Subscribe now and you'll get a free Welcome Block sent to you! I think that's the best deal right now. It's automatically added to your order but will be removed if you choose to use a coupon code. If you've already received a Welcome Block, you won't receive another one. You can try using coupon code SUBBOX to get 15% off your order. What did you think of this months box? Anyone else love the Legend of Zelda? I'm totally going to play Zelda2. The spring chicken is not from Minecraft... is from the "Legend of Zelda: A Link to the Past" snes game.